Speaking of games…one of the greatest competitions in sports has just ended. During March Madness, 64 women’s teams and 68 men’s teams enter the tournament, want to win and need a competitive advantage to make it happen. The same is true is business. The markets are saturated, the scope has gone global, and every organization is looking for a competitive advantage to make them a winner in their industry. So, what is the biggest game-changer for business today? In a recent survey of 300 leaders globally, nearly 75% agree that leadership development is very important in creating a competitive advantage for their organizations. And we couldn’t agree more! Just like in sports, if you’re not actively building and strengthening your bench, then it’s impossible to sustain any level of success. If you want the best people on your team, then you need to invest in them, develop them, and create a powerful pipeline of talent. Candidates today rank professional/leadership development higher than compensation when deciding between offers and which “team” to join. Coaches know that when players feel valued and developed, they will run through a brick wall and consistently go above and beyond to produce bigger and better results. By investing in leadership development, it increases employee engagement and productivity, reduces turnover, and fosters a culture of empowerment, ownership and community. Your people will work harder, will care more, and will have a positive impact on your organization’s bottom line. No two sports’ seasons are the same. Rules change, players change, and leadership can change…just like in business. Today, constant change and disruption is the norm, and success is a direct result of an organization’s ability to pivot and navigate change. The stronger and more equipped your team is with resilience, nimble problem-solving abilities, and effective interpersonal communication skills, the more successful they will be when it comes to responding to an ever-changing business landscape. Actively investing in your people is no longer considered a “perk.” It’s a must and the competitive edge every organization needs today. If you’re looking for a slam dunk when it comes to leadership development…look no further! Women ON Point: Next Level Leadership is the leadership development program for you and your organization. 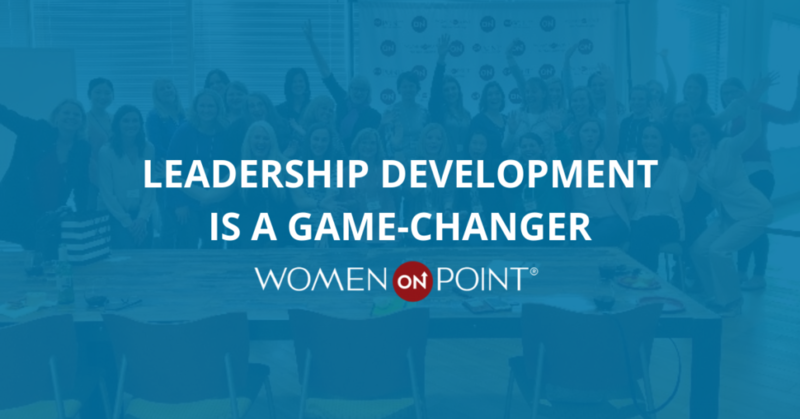 With a nearly 60% success rate ROI, including off-cycle raises, promotions, board positions, awards, recognitions, and new opportunities, Women ON Point has set the bar high and is a true testament of the power of leadership development. There is still time to get in the game and join us in San Francisco!